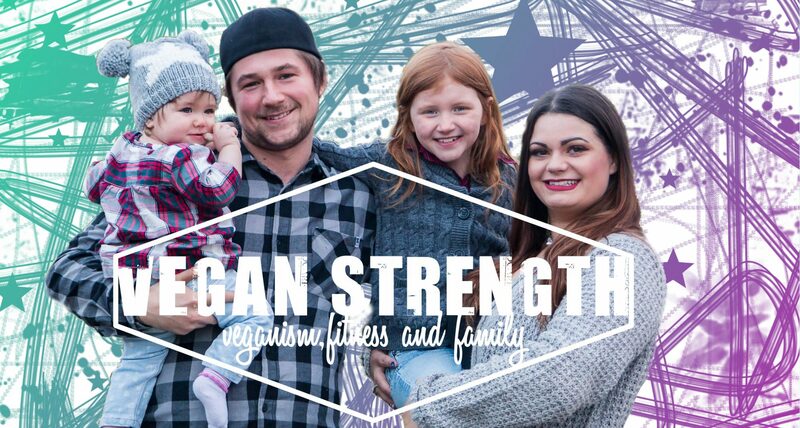 join us as we revolutionize our lives through veganism and fitness! This was spot on. So yummy on a warm bun with a sprinkle of vegan cheese! This was definitely a good alternative to pulled pork. I can not wait to make this again and have Aubrey try it! 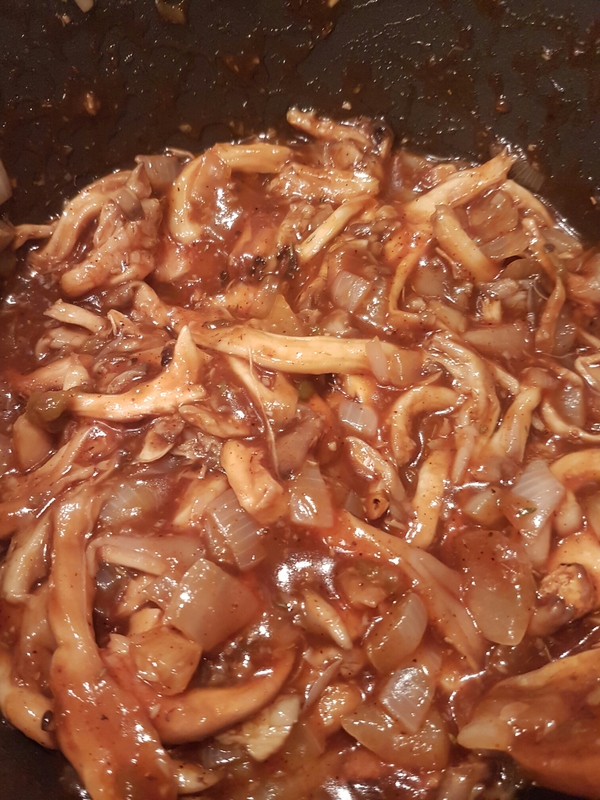 Chop onions and pull/cut mushrooms into stringy long pieces. Place a large cast iron skillet or large pot on medium high heat. Heat up the oil and saute the onions and garlic until soft. About 8 minutes. 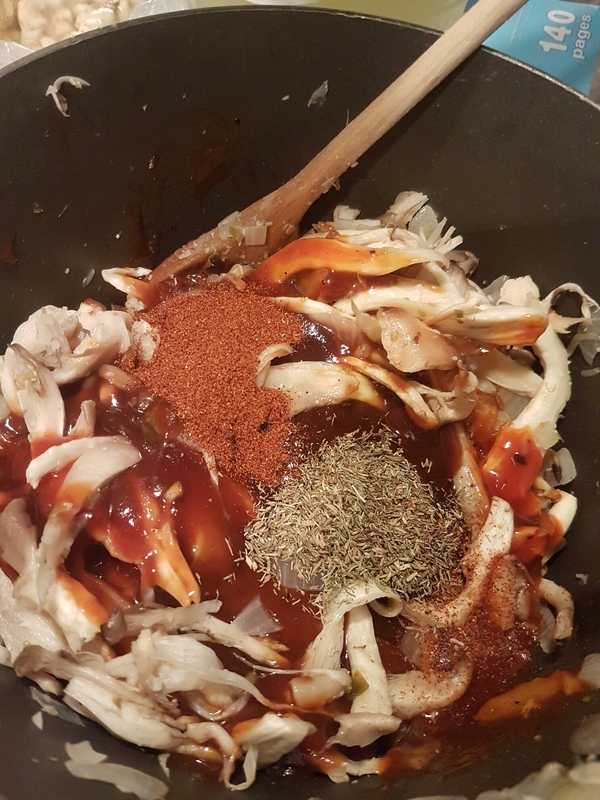 Then add mushrooms and mix well. Add spices , liquid smoke, coke and bbq sauce. Cook on medium heat for 20-25 minutes stirring occasionally. If it starts to boil reduce heat. Allow to cool for about 5 minutes before serving, it is very hot! 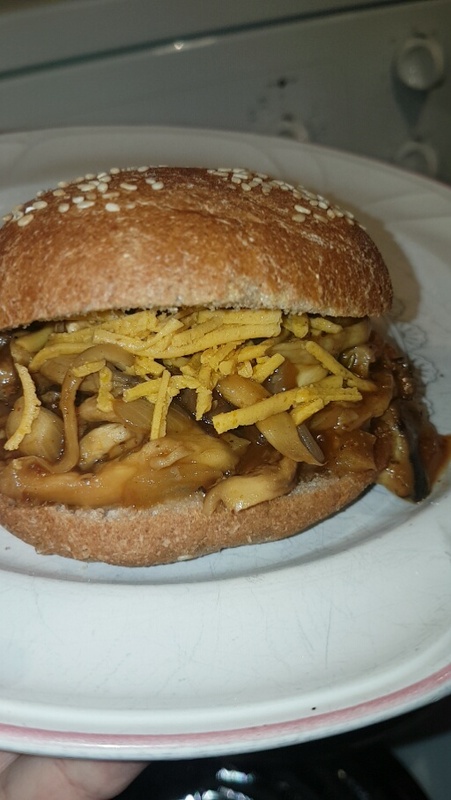 Serve on your favorite bun with your favorite vegan cheese and enjoy! These were a hit. 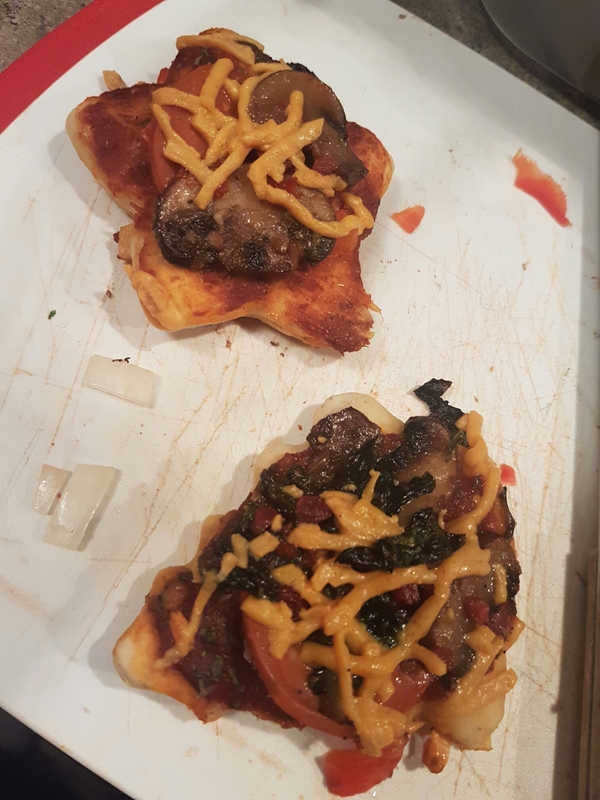 Next time we will make our crusts a bit thinner and try mini pizza pockets but they were still so delicious! 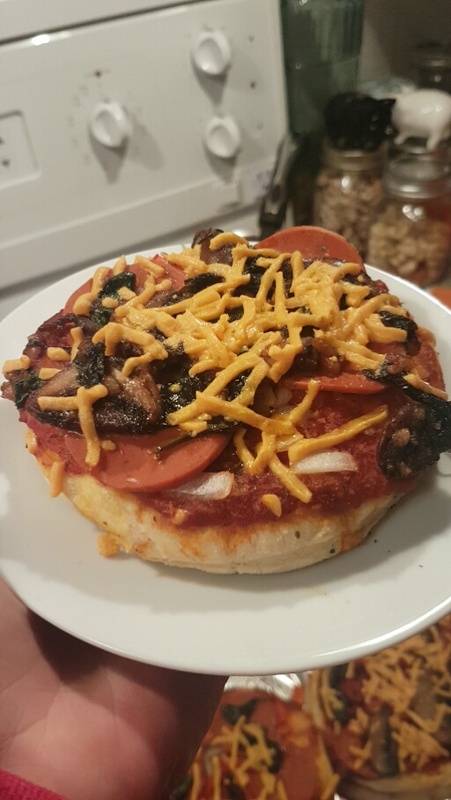 We used Daiya cheese shreds and Yves vegan Pepperoni! Being vegan doesn’t mean no more pizza! Aub loved helping us with this one. She even used cookie cutters and made herself and her little sister a special pizza. When kids help grocery shop or prepare the food, I find they enjoy it so much more! We put all of our dry goods into our food processor attachment on our ninja. Or mix in a large bowl. Slowly add oil and water while mixing until a soft,sticky dough ball is formed. Slightly oil a bowl and cover dough ball in it for a minimum of 10 minutes. Use your favorite pizza sauce. We used Eden Organics Pizza sauce. I think it might be our new favorite. You can also use any canned pizza ot pasta sauce. Or make your own. 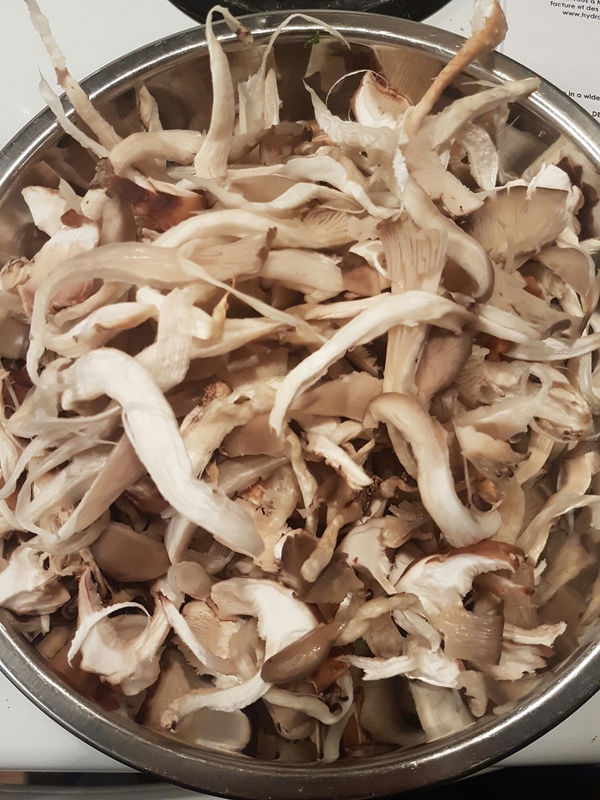 I suggest sauteing mushrooms,onions and garlic before using as a topping. It gives it a nice flavor. What 85 days of Veganism feels like. 85 days ago we decided to stop contributing to the madness. We decided to fight the mainstream and do what we knew in our souls is best for our health and our family. We knew it was going to be tough. Mostly coming to terms with the fact that we are now vegan in a meat eating world. It is hard realizing the truth about our world and society. It can become rather depressing when you realize everything you thought about food and nutrition is a lie. It can also be hard to deal with the idea that you have personally been conditioned to accept this madness as the norm. Using animals for anything is WRONG. They are not ours to exploit for taste or tradition or any reason for that matter. They are not for us to use in anyway. We do not need to eat animals to survive. Ask the vegans who live on average 7 years longer than a meat eater!! These past 85 days have been truly life changing and phenomenal for us both. We have drastically changed our lives. I am so proud of how much healthier we both are living. Dustin and I used to binge on fast food, dairy, meat, pop and every other unhealthy food imaginable. Health was never the reason we ate, we ate for fun, for taste, for pleasure. And in turn that made our unhealthy and sluggish. When we saw Forks over Knifes and realized our diet and lifestyle was seriously doing us damage we decided to make a change. We started not buying anymore animal products and used up what we had left or gave it away. We watched cooking videos and veganism videos to keep us educated and motivated. We cooked together and looked up vegan versions of our favorite foods. Going vegan truly brought us closer. It made us both healthy spiritually and physically. It helped us truly connect to our core values and morals, and living like that has a profound effect on your outlook on life and your place in this web of life. 85 days vegan and I have lost 25 pounds. All I did was cut out all animal products. I still eat vegan junk food and have not exercised much. Dustin has gained 10 pounds and has gotten much more muscular. We both had very different health goals for ourselves but a vegan diet can healthfully achieve both muscle gain and fat loss. 85 days vegan and we feel so good! Never looking back. Now to reach our 2017 goals. Personally I want to focus more on wholesome, whole foods and limit my processed food consumption. We also want to help more people go vegan this year and show others that it is not as hard as it may seem! We hope everyone has an amazing New Year and uses this new year as a motivator for personal change!! !